Please review FAQ information if you are uncertain as to your eligibility to enroll in courses via Open University. Matriculated Cal Poly students may not enroll in Open University. A matriculated student is a student who is, through normal procedures, admitted formally at Cal Poly to pursue an authorized degree, credential or certificate (for academic credit). If you are a previous Cal Poly student, make sure you have removed any holds from your account. 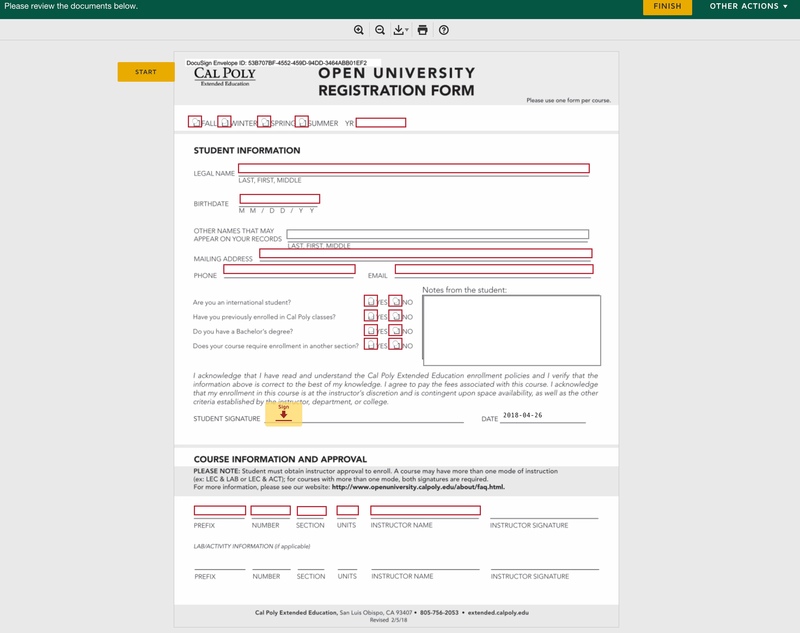 Open University allows disqualified Cal Poly students to enroll in classes for academic credit and thus gives them a chance to raise their grade point average while taking degree applicable courses, should they choose to re-apply to Cal Poly. Students will need to provide documentation from their dean’s office allowing enrollment through Open University. For more information on conditions leading to academic disqualification or dismissal, see http://www.catalog.calpoly.edu/academicstandardsandpolicies/academicstandards/. This process will allow your registration to progress electronically, which is especially helpful for you when obtaining instructor signatures for your enrollment. Rather than coming to campus to obtain signatures, all permissions will be handled via email. PLEASE NOTE: You must create a separate registration form for each class. Steps are shown below. Please see the Deadlines and Important Dates page for the date when PASS is available as well as the earliest date completed form may be submitted. Forms will not be accepted prior to that date. NOTE: Enrollment is based on space availability after matriculated Cal Poly students have enrolled, as well as other criteria established by the instructor, department or college. STEP 1 View available Cal Poly Classes. NOTE: The schedule of classes is only available online. View courses online at PASS. Course descriptions and prerequisites, if any, are also listed. Directory and academic department contact information can be found in the Cal Poly website directory. STEP 3 Click on the Open University registration form. Note: You must use a separate form for each class. STEP 5 An email will be sent to you with a link to complete the form. STEP 6 Open email and click on "Review Document"
STEP 8 Complete the form and click "Finish"
If you cannot complete the form in one sitting, click Other Actions in the top right corner and then click Finish Later. You can access the form again by clicking on the same “Review Document” link in the email. 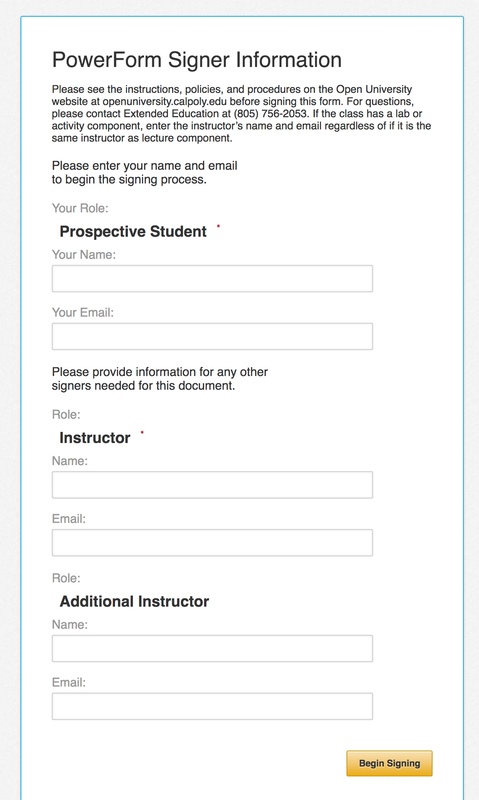 STEP 9 Instructor(s) will automatically be sent the form to sign. STEP 10 All parties, including Open University, will receive a copy of the completed form. STEP 11 Once enrollment is processed, an email confirmation with payment instructions will be sent. This process requires coming to campus to obtain signatures from instructors. Click the steps below for more information. View available Cal Poly Classes. Note: The schedule of classes is only available online. Or pick up a Registration form from Cal Poly Extended Education, Science Building 52, Room E34. Monday through Friday 8:00 am - 5:00 pm. A separate Registration Form is needed for each class. Obtain instructor consent to enroll by having them sign registration form. Contact information for each academic department is on the Cal Poly website. Enrollment is based on space availability after matriculated Cal Poly students have enrolled, as well as other criteria established by the instructor, department or college. 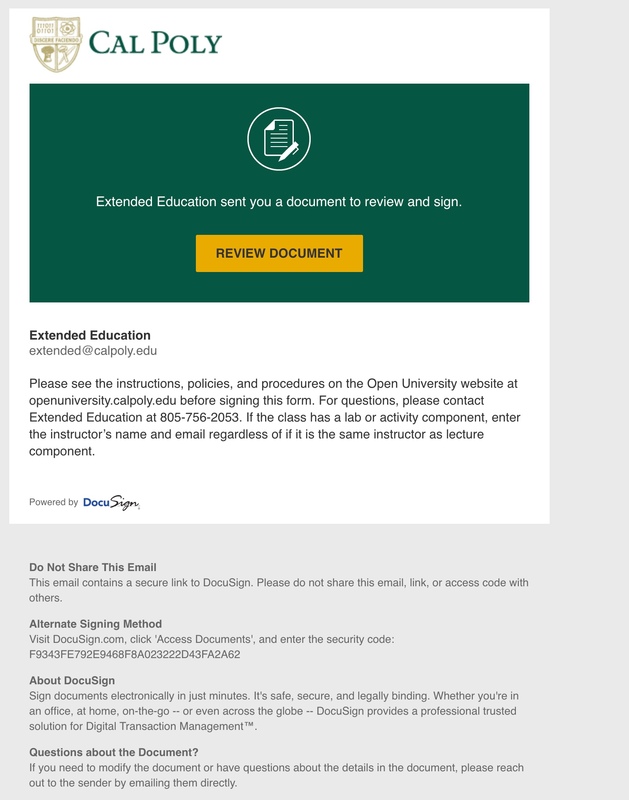 Return completed registration form to Cal Poly Extended Education. Once enrollment is processed, an email confirmation with payment instructions will be sent.